As much as we may love our fathers, we’re all guilty of using the “dad” prefix as shorthand for uncool. Dad bods, dad jokes, dad jeans—they’re endearingly dorky, sure, but decidedly outside the realm of trendy. But here’s a mind-bender for all you hip folks out there: dad style has now become hot AF. Perhaps it’s due to that old adage about fashion going in circles. After all, so many iconic dad looks are simply remnants of the styles prevalent in the mid-20th century, and we all know retro is very in vogue, right now. Or maybe it’s because of their attitude towards dressing themselves, that I-don’t-give-a-damn-as-long-as-I’m-comfortable sort of mindset that we’re all trying to imitate nowadays (in a very studied way, of course). Not gonna lie, it’s oh-so-easy to bomb this look. The tee tuck is one of the most dad (and grade school) looks ever, and if you’re not careful, that’s exactly how you’ll come off. But as long as you remember a few fashion rules, you won’t have trouble pulling off this nonchalantly suave get-up. The most important thing to remember when tucking in your shirt is that you need to tuck it inside a well-fitting pair of pants. Slim-cut trousers or skinnies will look best paired with your shirt, but slightly baggier bottoms will work too as long as you adjust how high it’ll lie on your waist to balance out your shirt. You can also slip on a manly belt for added character, and roll up the sleeves of your tee for a more vintage look. The last few years have had fellas flashing their naked ankles no matter how many layers they donned on top. 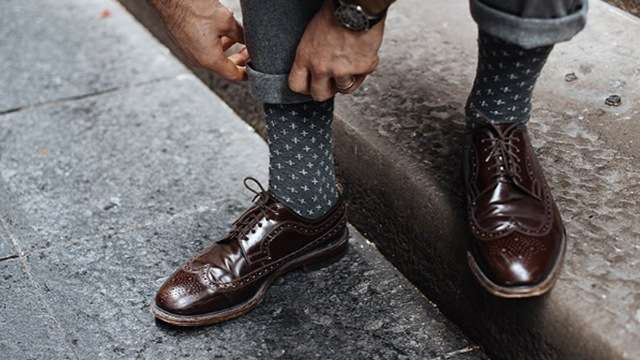 And while we admit that the exposed ankles look has done a lot of good in pushing male fashion forward, it’s time it gave way to the statement socks trend. Which, if you remember, our dads have been rocking since forever, even when their pattern choices were pretty tame, they never did dare go out without their calf-highs on. The key to this look is coordination. You need to match the color of your socks with your pants or shoes, but your socks shouldn’t clash with the rest of your outfit either. So if you want to make a statement, make sure your socks are a pop of color that complements your pants. On the other hand, you’re pretty much good to go no matter what you have on top if you choose neutral colors and prints. If you opt for this, don’t be afraid to liven things up by hemming your trousers to end well above your ankles. Gone are the days when short-sleeved button downs in bold prints (aka hawaiian vacation shirts) caused instant cringes all around. Now, it’s at the height of fashion and daring for a guy to pull on such a shirt, a move proving a keen sense of cutting-edge style. While we acknowledge just how forward-thinking our dads were when they stodgily stuck to this style, the shirts that are really hot right now are more variations on a theme, instead of actual Bahama shirts. So when picking out your own hawaiian shirt, make sure it’s cut to flatter your body instead of hang off you like a tent. Also choose fun, artsy prints that are pleasing to the eye instead of mismatched floral patterns that are just plain fugly. Now, you can tuck these into your pants with three to four buttons open, or closed all the way to the top and hanging out over a pair of skinnies or tailored shorts. For a more subdued look, pull on a plain black jacket on top. Once upon a grungier time, the thing to do when you received a pristine pair of white kicks was to scuff it to hell and back until it looked it’s dirtiest, grimiest best. Back when the holey-and-frayed jeans and similarly holey-and-frayed t-shirt trends were going strong, the sartorially-savvy wouldn’t be caught dead wearing the blindingly white sneakers that dads everywhere favored. Oh, how the times have changed. First of all, take heed that if you really want to follow this trend, you’ll need to exert some effort keeping your shoes clean. Now, the great thing about this classic piece of footwear is that it looks good on pretty much everyone. To best show them off, pair them with ankle-baring, tight-fitting pants. If you prefer high-tops or skate shoes, go ahead and tuck your jeans under the flap for a slimmer silhouette. To be honest, we never expected this particular turn in the fashion trends, but we won’t deny how good it looks. Who knew our dads were really leading the pack, right? So cheers to you, pops—you’ve got serious style.